Born out of a genuine and impassioned love of alpacas, an eagerness to share their unique story, and an elemental need to make certain that our garments are accessible to everyone. We are a group of impassioned Americans who fell in love with alpacas long before we hung out a shingle to sell items made from their fiber. As a result, we've established four unique apparel brands focused on creating the best American vision for alpaca fashion and alpaca products. From the women’s and men’s apparel and home interiors to athletic, business and casual alpaca socks to vintage styled 100% alpaca golf sweaters, we strive to make the best products possible. All of our products are designed with thought and care, right here in the United States, focusing on the needs and expectations of the American consumer. 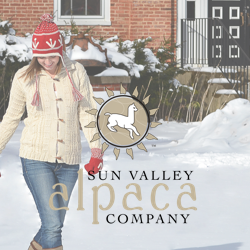 Over the past 20 years, We have been consistently growing and expanding, finding niche areas that alpaca can improve, and continue in that vein today. Proprietor K. DeVos-Brooks began breeding alpacas in 1997 in Western Pennsylvania. Finding a disconnect between the existing alpaca products available at the time and fashionable garments that a US clientele would not only wear, but love, caused her to investigate what could be done to bridge this gap. Melding her design experience with her devotion to alpacas, she began to create fashion forward items that fit her high expectations of form fit and function, culminating in the establishment of Inca Fashions - INCA being both a tribute to the culture that had nurtured and loved alpacas, literally saving them from extinction, as well as an acronym for Incredible Natural Creations from Alpaca. This moniker is behind every fantastic piece of apparel the company creates. 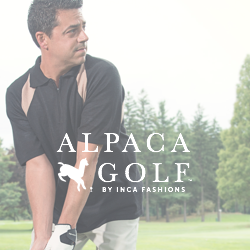 Now an international venture, Inca Fashions is committed to providing the finest alpaca wool apparel, products and accessories to its customers, not just at home but worldwide, so they too can fall in love. DeVos-Brooks knew that once people experienced alpaca, they’d be seduced by its splendor. Alpaca fleece is one of the softest materials your fingertips will ever touch. Once spun and knit, it becomes a luxury fabric, warmer than wool and cashmere, yet far easier to care for. Being non-porous and naturally hypo-allergenic, it doesn’t promote odor nor does it hold dander or oils. It’s exceptionally versatile with natural thermal properties and breathability which makes it warm in the winter and comfortable in the summer. Extremely durable, it becomes softer and cozier with age. Inca Fashions specializes in 100% pure alpaca, because the company knows just how wonderful pure alpaca is. Pure alpaca is not often found in the marketplace, due to its cost. There is nothing more splendid than a pure alpaca sweater, or cardigan or blanket… nothing rivals it, its feel to the hand, its feel to the body. When blends are used, it is to create a certain look or texture; as alpaca improves every other textile fiber it is paired with and not in an attempt to reduce costs, which is often the case with other fabricators of alpaca knits. When blending, the company uses not only the finest alpaca but the finest compatible textiles so the alpaca sweater, or blanket, or scarf, meets their commitment to excellence. In 2004 it became the first U.S. company to receive accreditation by the prestigious International Alpaca Association (AIA), signifying that it meets the highest standards of the alpaca industry in terms of fiber content and quality. It’s not only important to Inca Fashions to take care of the environment, it’s just as important to create and maintain strong relationships with the artisans and knitting cooperatives it works with. While designed in the US, Its clothing is proudly manufactured by hand in Peru and Bolivia under environmentally and socially responsible Fair Trade principles. Inca Fashions is proud to showcase the work of these talented craftsmen and women who have honed their skills, sometimes through generations, and over decades. The Inca Fashions staff works closely with the artisans and knitting cooperatives to maintain the highest levels of quality control and production and planning management. Its Prices are set together with the cooperatives, paying fair wages for production while enabling them to strengthen their pride in their craftsmanship in a way that sustains tradition, home, land use, and community bonds. Inca Fashions is the only company in the United States to offer a line of products that are 100% certified organic alpaca. Located in Peru, the yarn manufacturer is the only licensed producer of organic alpaca in the world and operates in socially responsible and inspected facilities. It is the first company of its kind in the Americas to be both organic (Control Union EU Skal 4235 and 5051, GOTS and NOP) and Fair Trade (FLO CERT ID 4543) certified. Organic fabrics are never sprayed with harmful pesticides, fungicides, herbicides or chemical fertilizers, nor are they scoured or cleaned with harsh chemicals. Organic methods of agriculture and manufacturing promote clean water, air and environment, and are inherently better for the general health of the population and the preservation of the planet. Kim DeVos-Brooks began as an alpaca breeder. With a background in design, Kim had a sincere appreciation and love for alpaca fiber and wanted to bring awareness to alpacas. She opened a retail store in October of 1999, just north of Pittsburgh PA, and started sharing with others her love for alpaca, focusing on the benifits of alpaca for the consumer. The alpaca community rallied around her designs as until that time, only South American-inspired garments were available. Many fellow alpaca breeders contacted her wanting to purchase and re-sell the goods, often stating that her items were "how alpaca should feel".